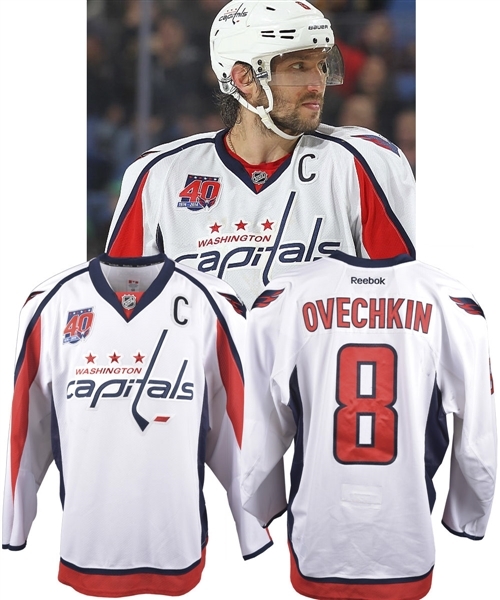 Lot Detail - Alexander Ovechkin's 2014-15 Washington Capitals Game-Worn Captain's Jersey with LOA - 40th Patch! - "Rocket" Richard Trophy Season! - Photo-Matched! 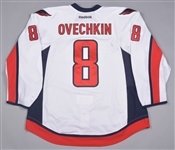 Alexander Ovechkin's 2014-15 Washington Capitals Game-Worn Captain's Jersey with LOA - 40th Patch! - "Rocket" Richard Trophy Season! - Photo-Matched! A seven-time winner of the Maurice “Rocket” Richard Trophy for most goals in a season and winner of four consecutive, Alex Ovechkin practically owns the award, with only four other players managing to win twice since it’s inception in 1998-99. From his fifth win of the prestigious trophy which was also his third consecutive, we have a Washington Capitals photo-matched captain’s jersey worn by the Russian superstar, in 2014-15. 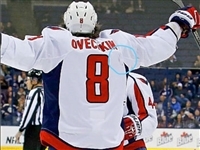 A label with “58” sizing is affixed to the collar, with embroidered NHL and Reebok crests on the front and back necklines respectively. 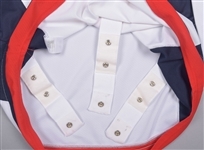 Styled with an attractive tri-colour Capitals’ team crest with embroidered detailing, the solid white V-neck has been embellished with red tackle twill sleeve and verso numbers with navy trim, with matching alternate crests over each shoulder and the Caps 40th anniversary crest over the right breast. A MeiGray patch numbered “L00952” sits over the inside hem with a matching LOA to accompany, and according to their population report, the jersey is a "White Set 2 w/C, w/ 40th Anniversary Patch" example. 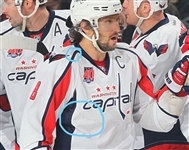 A few random marks are visible over the sleeves and beneath the team crest, with a couple large stick marks over the reverse right shoulder. 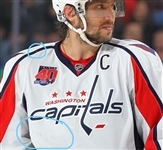 There is also some loose threading over the right elbow, with the jersey in otherwise gorgeous condition. Getty Image #466541508 from March 16th 2015 has been matched to the series of black marks below the team crest, while Getty Images #466711710 (March 16th), #467908404 (March 19th) and #467683360 (March 21st) have all been matched to the loose white thread that covers the blue piping above the 40th patch, and to the series of black marks below the team crest.